Warmer weather brings star-party season, when folks gather for big regional events or local gatherings put on by neighborhood astronomy clubs. 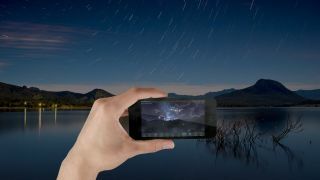 In this edition of Mobile Astronomy, we'll look at how to use your mobile device to make the most of the star-party experience, including how best to configure your devices and apps. Every astronomer I know loves showing the public the wonders of the skies, either via a telescope or simply by pointing out the constellations and bright planets. The best ones are ready with some facts or folklore to make the objects much more interesting and meaningful. Don't be shy about approaching the telescope, but do observe the following simple rules of star-party etiquette. Ideally, the astronomer will have given you an idea of what you'll be looking at. Once at the eyepiece, take a nice long look all around the field of view. You'll be waiting for moments of clarity when the atmosphere settles down, and a fast glance might miss that. When looking at dim galaxies, try using averted vision. The astronomer will explain how to do that. Finally, remember to breathe. Your eyes work much better with plenty of oxygen. Ask lots of questions, and be prepared to listen — but allow others to chime in, too. If you don't hear all the facts, at least find out the name or designation of the star, planet or other object, so you can search for it on your astronomy app and pull up some more information. One of the most important tips for star parties is to avoid using any bright, white light. The human retina is equipped with two types of receptors: rods and cones. Rods are more sensitive to dim light, but need time in darkness to build up to maximum efficiency — at least 10 minutes and, optimally, half an hour. Exposure to white light resets the clock, but long wavelengths of light, especially red light, do not. That's why you see astronomers using red lights for power indicators, and reading their star charts with red headlamps. To preserve dark adaptation, astronomers use a variety of red-light accessories, including flashlights, headlamps, and red film placed over computer and device screens. To be a good star-party guest, make sure that you avoid white flashlights and flash photography, and that you turn the brightness of your device's screen to minimum. Your dark-adapted eyes won't need bright lights anyway. Better yet, use an app that turns your screen red, like Twilight for Android or Red Shift for iOS. Another great option is to purchase some clear-red-gel film, also known as rubylith (used for astronomy and for stage lighting), and cut it to fit over your screen. The deeper the red, the better. By the way, if it's a full-moon star party, people will not be as careful about light. Smokers should be aware that smoke particles can coat telescope optics. So, if you are smoking under the stars, be sure to stand well away from any equipment that isn't your own! Nearly all astronomy apps incorporate an option to redden the display. It's usually called night mode. Be aware that if you exit the app, or receive notifications, they may pop up in white light. Astronomy apps are a terrific addition to public star parties. Assuming you've already dimmed or reddened the screen, here are some additional tweaks to make your device a valuable addition to the experience. The SkySafari app features a handy icon to toggle night mode on and off with a tap, painting the main screen and all menus and keyboards in red. Both modes are shown here for comparison purposes. The sky overhead depends on your location, the date and the time. To ensure your device matches the stars, set up your app to grab your location from GPS, or set your location manually. Within 60 miles (100 kilometers) of the nearest major town is fine for casual stargazing. Your device will have the correct date and time from your network, unless you're on vacation far from home. It's a good idea to check all of the above before leaving your house. It's easier to navigate the sky if the number of stars on your device is comparable to the number visible in the real sky. You can ensure this by adjusting the app's visual magnitude slider until you see about the same number of bright stars. Once you're comfortable finding your way around the sky — or scanning around with binoculars, which pick up fainter stars — dial up the number of stars displayed in the app. If you are planning to observe planets, it's a good idea to enable the track of the ecliptic in your app. The ecliptic traces the plane of the solar system across the sky, and the moon and the planets will always be found on or near this line. Finally, try using the app with and without compass/VR mode enabled. If the device's gyro and compass are working well, positions in the sky should match up with your device. This is easy to check with an obvious target like the moon or Jupiter. If not, switch it off and navigate by swiping around the sky with your fingers. I prefer this method because I can lower my device and call up data on it without losing the object. Most sky-charting apps allow the visual magnitudes of the stars to be adjusted to show more or fewer stars. Use this to match your observing conditions. The left-hand panel shows the app as configured for a typical suburban sky, while on the right, more stars are enabled, as seen under a rural sky. Here are some additional things to bear in mind when attending a star party, or when heading out on your own. If you are going to a remote location to flee light-polluted city skies, file a "flight plan." Let loved ones know where you intend to go, plus the route you will be taking and when you expect to return. Even if you're just walking to the local park, it's a good idea to let someone know. NASA has created a global geo-referenced mosaic of the Earth by night called the Black Marble (details here). This image allows you to see where lights are plentiful or absent in a given area. You can load Black Marble as a layer into Google Maps and zoom in for details. The most recent edition is from 2012, but you might be able to find more recent images for your town. The astronauts on the International Space Station have published quite a few recent pictures of major cities at night. The Black Marble is a global mosaic from NASA that consists of nighttime satellite imagery that has been geo-referenced for use in Google Earth. Zoom in on your city to find areas with less light pollution. Don't forget to dress for cold temperatures! Even summer evenings can get unexpectedly cold as the night wears on. Always have long sleeves and pants, and perhaps a hoodie, too. This also helps with the biting insects. Snacks are a great idea, but be sure to leave the site the way you found it. Finally, my astronomy friends and I like to listen to music while we observe. Our choice is usually classic rock, but you might prefer opera, classical music, or even science fiction film and TV-show sound tracks. Whichever you prefer, make sure that everyone is on board with music before you crank it up. Otherwise, pop in the ear buds for your mobile device and enjoy your tunes privately while everyone else listens to the night sounds of nature under the stars. Coming soon on Mobile Astronomy, we'll cover in more detail taking astrophotos with your phone, and I'll be reviewing some new astronomy virtual reality apps and hardware. Until then, keep looking up!